Go Green Without Going Extreme! If you’re looking to go (a little) green without going weird or overboard you are in the right place! I care A LOT about our planet and doing my part to keep it healthy BUT I am also a mom of three busy kids, 1 dog, 2 cats and my husband. I am definitely not a super mom that gets it all (and more) done. I’m just a regular mom who feels passionately about doing what I can to keep my family – and the planet – healthy. Since I’m passionate about going green – but NOT a super mom – I’m always searching for EASY ways we can live a little greener. I want to prove to you that going green does not have to be hard (or weird, or crunchy, or uncomfortable!). Now that you’ve heard my “why” here’s the who…who in the heck am I and why should you listen to me?? 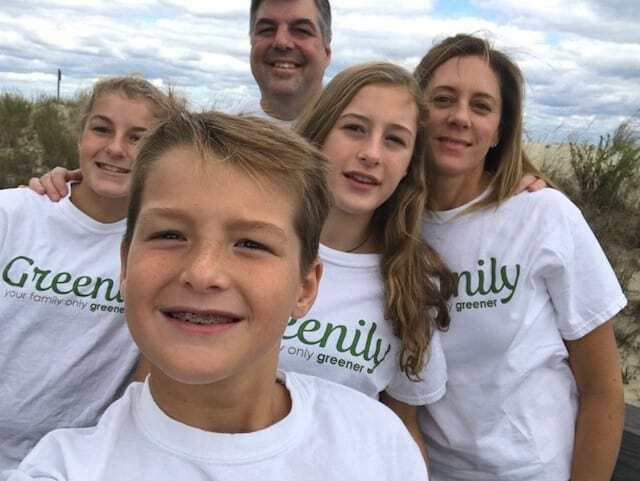 My name is Pam and my family (3 kids, my husband, 2 cats and a dog) is Greenily (green+family). Our experiences (the good, the bad and the ugly!) provide the ideas I share with you about going (a little) green. Before becoming a SAHM about 8 years ago I worked in advertising. My next move was into corporate philanthropy which led me to 10+ years working in conservation education at the National Zoo in Washington, DC. My role was to help educate the public about endangered species and their habitats in faraway places like Namibia and China. It was an amazing experience! Who wouldn’t love walking by majestic cheetahs (my favorite animal!) every morning on the way into the office?? Once the fog of having 3 kids in 4 years lifted, I set my sights on bringing the conservation message closer to home. I take all the stuff I make my family try and turn it into helpful blog posts, cheat sheets and mini courses for you to use. I don’t know about you but my mom (and 49 year old!) brain likes it when things are sorted into categories so I can wrap my head around them – and not forget them. So, you’ll notice on Greenily that things fall into 4 categories. The categories I use are How to Reduce Waste, Ways to Conserve Energy, Ways to Conserve Water and Toxin-Free Living. You might be wondering, “Where am I supposed to start?” Well, you really can start anywhere! If you’ve been thinking your cleaning products could use a makeover to something safer, start with Toxin-Free Living! Or if you are feeling a little guilty about the enourmous amount of trash your family produces in a week, start with How to Reduce Waste. Here’s a link to the main page for each category. There you’ll find all the related blog posts that can help you make some simple changes in that area! 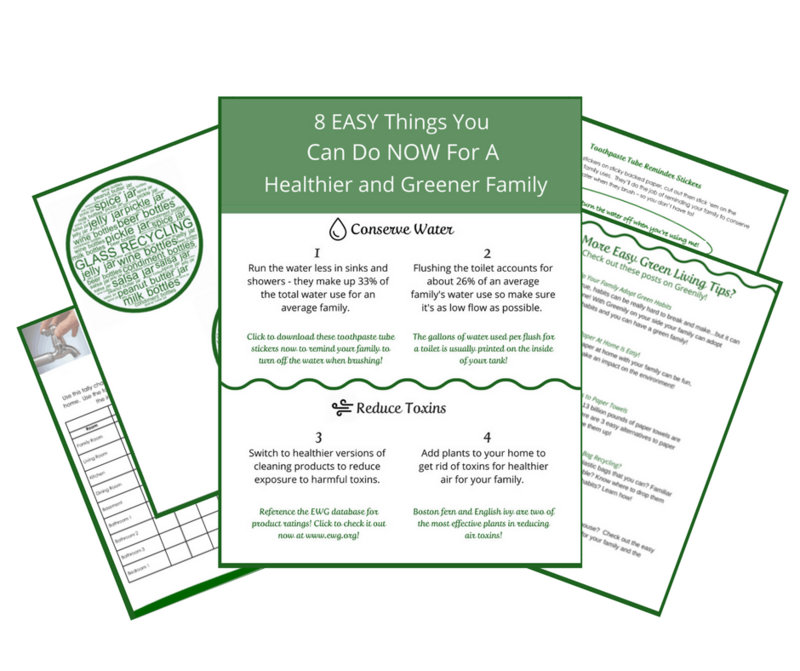 And, if you want some step-by-step guidance, check out the two FREE cheat sheets – Quick Guide to Safe Bathrooom Cleaners and 8 Easy Things You Can Do NOW for a Healthier and Greener Family! Switch to safer cleaning products NOW. Just check the list and click the link! Stop guessing which products are actually safe. ‘Cause cleaning product labels can be confusing and misleading. Save time and skip the search to figure out where you can buy safer products. All that info, and more, is right at your fingertips! 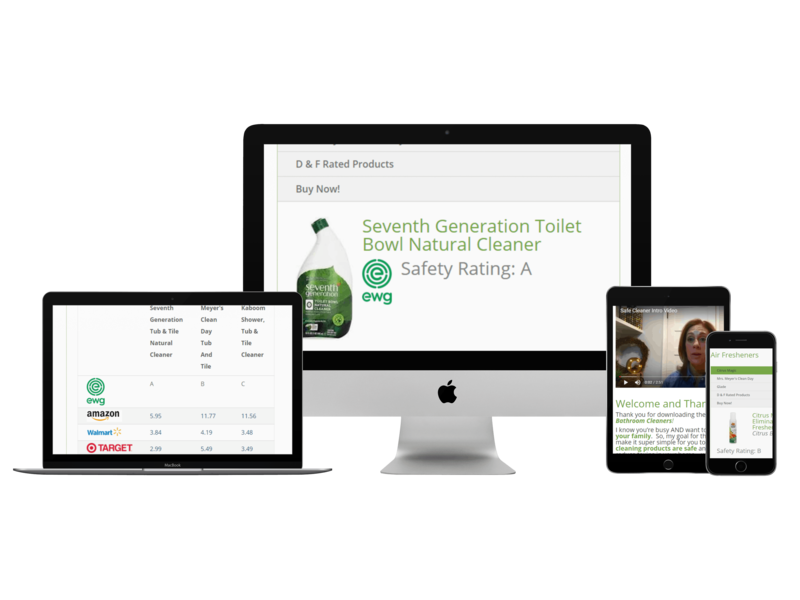 Instantly access the online list of safe cleaners anywhere. Your phone (while at the store) or your computer (while you’re shopping online at home). No more forgetting your list at home! Feel great about making the switch to cleaners that are safer for your family and the planet! Give yourself a big pat on the back! Success! Now check your email to confirm you'd like to receive the list! Take mini, bite-size steps toward living a little greener. Jump start your green routine by doing simple tasks that fit into your life. Save time and skip the search to figure out where to start. Use the included printables to help get your family on board too – saving you from lots of nagging! Feel great about making changes that are good for your family and the planet! Finally, let’s stay in touch! I hope you find just what you are looking for here at Greenily! You are always welcome to email me at pam@greenily.co or jump over to the Contact Us page and send me a message. You can also sign up to get my weekly email. I like to keep it short, sweet and unintrusive while also dropping a few helpful tidbits I’ve come across or am working on to keep the “weird” to a minimum but the greenness to a maximum. Finally, I hang out on the usual social media platforms (Facebook, Pinterest, Instagram) and would love to connect with you there too! Just click the little icon below to head on over!